25 July 2018 – Meg Terwilliger has joined the Birthwise staff as the new Admissions and Recruitment Coordinator. 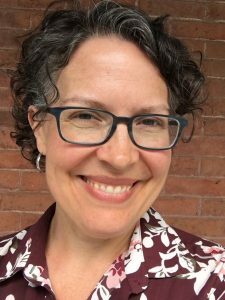 We’re delighted to have Meg–who brings with her experience working in admissions and enrollment management at the Maine College of Art–on board at Birthwise. She will coordinate the admissions process, recruit prospective students, and help them apply, enroll, and pursue their midwifery education at Birthwise. She holds a BA in studio art from St. Olaf College. My name is Meg Terwilliger and I joined the Birthwise staff in June. The focus of my work is Admissions and Recruitment, but I am also developing ways to stay connected with and serve Birthwise alumni going forward. I first learned about midwifery when I was pregnant with my first baby and researching ways to stay out of the hospital. I’ve had two home births which were among the most empowering experiences of my life and I was fortunate to receive the care and support of some really incredible midwives and student midwives, most of whom attended Birthwise. I am thrilled to be supporting those of you who are now pursuing your midwifery education. I am also a visual artist, amateur gardener and homeschooling mama. I live with my wonderful husband and our boys in New Gloucester, Maine. Please feel free to contact me anytime.